The Columbia Thyroid Biopsy Program is a leader in addressing multi-nodular thyroid disease and thyroid cancer. It offers same-day onsite evaluations, with surgeons coordinating with cytopathologists to minimize the number of biopsies required to get definitive results. The NY Thyroid-Parathyroid Center will be posting a number of important blogs, patient stories, and educational pieces to help educate everyone about the presentation, screening, diagnosis, and treatment of thyroid cancer as well as to help raise awareness of this disease. Dr. Lee and several other surgeons from the Department of Surgery collaborated with doctors in the Nuclear Imaging Department to invent a new type of parathyroid imaging, which fuses key aspects of both the nuclear medicine scan and the traditional CT scan, allowing surgeons to not only tell which parathyroid gland was malfunctioning, but also where exactly it is located and what its shape is. 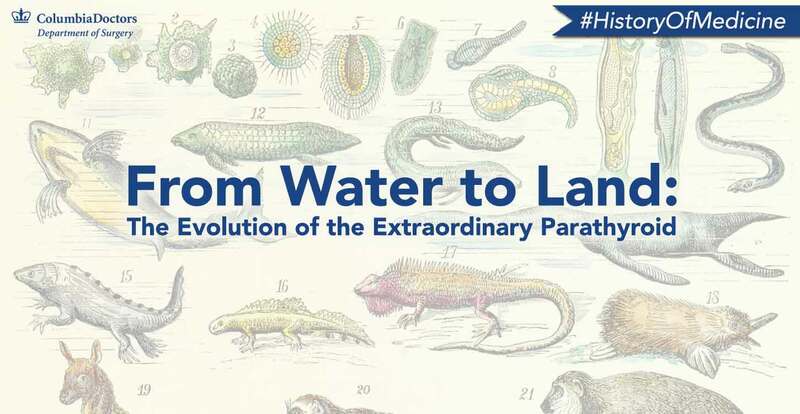 In order to understand the parathyroid glands, we are going to take you back in time – far, far back, to about 375 million years ago when a group of vertebrates climbed out of the water and onto land. Deborah Gerszberg, Clinical Nutritionist at The Pancreas Center, discusses the results of recent studies which suggest excess calcium supplementation can actually be harmful to your health.